The Texas Rangers this afternoon announced that the club has placed outfielder Delino DeShields on the 10-day disabled list with a fracture of the tip of his right middle finger. The team has recalled infielder/outfielder Drew Robinson from Triple-A Round Rock. DeShields sustained the injured finger on an attempted bunt in the 7th inning of Thursday night’s series opener against the Los Angeles Angels. The first date he would be eligible to return is August 27. 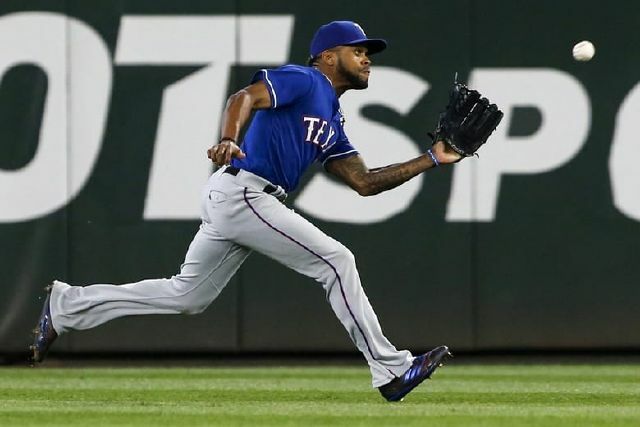 DeShields was also on the disabled list from March 31-April 21 with a fractured hamate bone in his left hand, and he was on the seven-day concussion list from August 4-11. DeShields has batted .204 with 2 home runs, 22 RBI, and a team-high 18 stolen bases over 85 games for the Rangers this season. Robinson will be in his third stint with the Rangers this season, also Opening Day-May 20 and August 4-11. He has batted .186 with one home run and 5 RBI in 32 games with Texas in 2018. He has spent the balance of the campaign with Round Rock, batting .303 (64-211) with 10 home runs, 28 RBI, and a .948 OPS figure in 53 games. After these transactions, the Rangers remain at the 40-man limit on the major league roster, along with 5 players on the 60-day disabled list. He began the year hoping for 15 homers and 50 stolen bases as he tried to jump from solid leadoff hitter to one of the game’s best. Instead, he has taken step backwards. On Friday, though, he sounded, at least, like somebody who understands the situation he’s created.